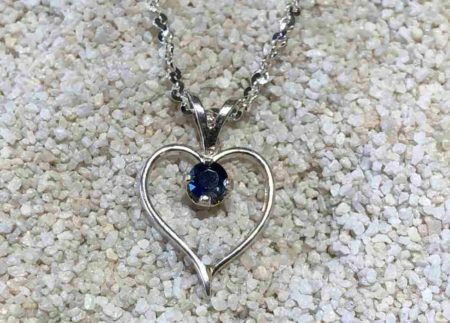 Own a piece of Montana with this gorgeous sapphire housed in a simple heart pendant. The color of the sapphire is a beautiful deep blue color. This beautiful pendant comes with an 18" chain. Contact us- we can help you find that perfect piece! This Montana Yogo sapphire pendant is created in 14k white gold. These beautiful blue sapphires are quite different than your standard gem mountain sapphires. The violet hue of the Yogo sapphire ranges from slight to strong but make these Montana sapphires unique. Cornflower blue colors of the Montana Yogo sapphire is what makes Yogo sapphires in Montana the most sought after. This Montana yogo pendent is beautifully dainty. Yogo Montana sapphires are the birthstone of September. This Montana Yogo sapphire pendant is created in 14k white gold. These beautiful blue sapphires are quite different than your standard gem mountain sapphires. The violet hue of the Yogo sapphire ranges from slight to strong but make these Montana sapphires unique. Cornflower blue colors of the Montana Yogo sapphire is what makes Yogo sapphires in Montana the most sought after. This Montana yogo pendent is beautifully dainty and perfect for night out. Yogo Montana sapphires are the birthstone of September.